We focus on historically correct original and properly preserved antiques or in some cases carefully and correctly restored antiques. And we never sell mediocre, replica, fake or tribute antiques. Period. Our focus and goal are to provide historically accurate, rare and unmolested Cinema Equipment and production related Antiques, in exceptional condition, for those who want to purchase an honestly represented and authentic antique without any risk or hassles. Our antique selection, product knowledge, item quality, and after-sale guarantee are second-to-none. Do you know that the item you found is historically correct? Do you know that it is even an “antique”? Have parts been dishonestly swapped out from cheaper or unrelated machines? Is it really as “rare” as it is described? Is it a “FrankenAntique”, made partially (or totally) from new Chinese or Indian imitation parts and made to look old? There are a profusion of these imports flooding the market today! Is the condition accurately stated? Does “mint condition” really mean “scratched and faded”? Does the replica or cheap-o item come with a signed and sealed Certificate of Authenticity, like all of our pieces do? Is the “original” finish truly original? How can you be sure? If it is refinished, were original materials used, or did someone slap some Polyurethane on it or polish it to an incorrect mirror-like finish, totally removing ALL of the original patina and correct finish? We Certify all of our finishes. Does the seller have an established reputation? 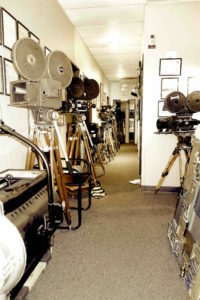 We have been dealing in Cinema Equipment Antiques for over 50 years. We are dismayed at what is frequently sold by some antique dealers as “100% original” or “historically correct”. These are often odd equipment items with incorrect parts, incorrect (swapped) data plates and/or poorly preserved pieces, with fake, cobbled together or poorly restored elements. This dishonest market place behavior compromises the integrity of all honest antique collections. 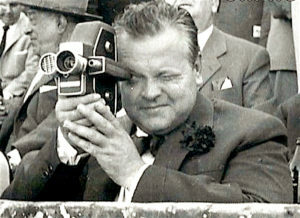 It propagates a very unethical and distorted view toward the Cinema Equipment Antique and Decorative arts community. Our policy of maintaining respect for the buyer and the historical importance of these antiques and artifacts assures that you are getting a correct and accurately represented Cinema Antique which will provide years of enjoyment and appreciating value. We guarantee that what we sell is exactly as described in our gallery and on our Certificate of Authenticity. We also offer an immediate money back approval warranty on all items sold as well as an extended warranty. Please see our terms of warranty. We reject over 95% of the so-called ‘Antiques’ that become available to us, as they do not meet our high standards for quality, authenticity and/or originality. This means that we are always on the hunt for the very best examples we can find. And finding superior and honest antiques is getting harder and harder for us. We stay away from supposed antiques have been stored in wet mildewy basements, damp garages, are poorly maintained, are badly restored, or tinkered-with, which destroys their value and authenticity. Our Cinema Antiques are not for everyone. They are truly curated as a museum would carefully curate their acquisitions. If it isn’t historically correct, then we don’t sell it as such. Period. We know that there are risks when ordering an item from an unknown seller online in this Internet age, especially with the promotional ‘hype’ that often appears with their items for sale. We see items for sale that are a hodge-podge of dishonest and different parts, including fakes (new reproductions) made in India or China. While many sellers are well-intended, they simply have no expertise in our field, do no research on items and don’t know anything about what they are selling. Our goal is to serve quality-minded buyers who want correctly represented Cinema Antiques, with an exceptional warranty, and are willing to pay a fair price for “the very best” available. We are extremely picky about what we sell so that we can be fully confident in offering the very best choices to our clients. We thank you for considering Cinema Antiques of Dallas Texas.